Has the AMO flipped to the cool phase? | Climate Etc. The AMO also plays a dominant role in the stadium wave. Klotzbach and Gray published a Comment in Nature Geoscience: Active Atlantic hurricane era at its end? [link; behind paywall]. The comment is getting some press, which is discussed in a post at WUWT. The AMO, an indicator of sea surface temperature (SST) variations in the North Atlantic, has been argued to arise from natural climate variations in the thermohaline circulation. Alternatively, it could be primarily driven by alterations in levels of sulfate aerosols. We argue that the weight of the evidence points towards natural oceanic variability being the principal driver of the AMO. 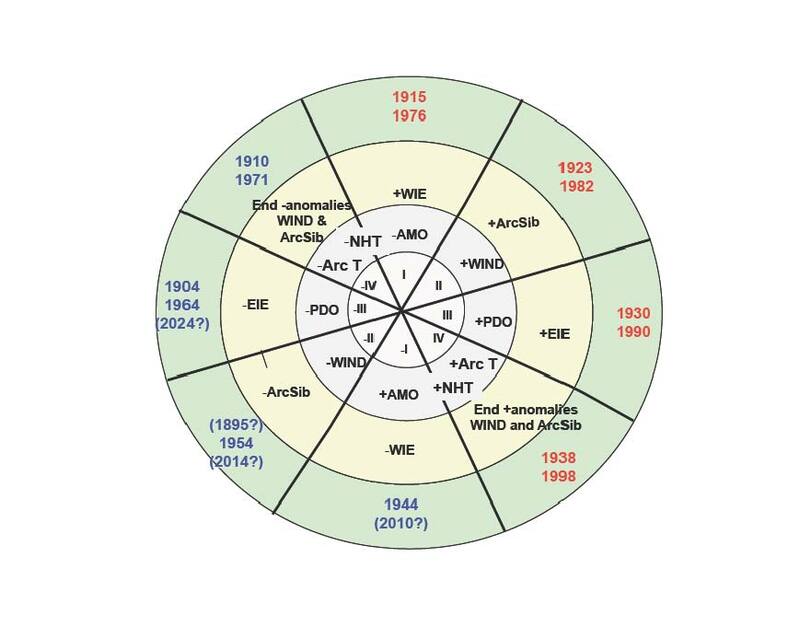 The AMO phase was classified as being positive from 1878–1899, 1926–1969 and 1995–2012, and negative from 1900–1925 and 1970–19942. Positive AMO phases are characterized by above-average far North and tropical Atlantic SSTs, below-average tropical Atlantic sea level pressures (SLPs), and reduced levels of tropical Atlantic vertical wind shear. All three of these conditions are known to create a more favourable environment for Atlantic hurricane formation and intensification. Atlantic SSTs from 50–60° N, 50–10° W and SLPs from 0–50° N, 70–10° W has been utilized to monitor the strength of the AMO in real time. When the AMO is positive, SSTs in the far North Atlantic tend to be warmer, while SLPs throughout the tropics and subtropics tend to be lower. This index has decreased since 2012: SST anomalies in the tropical and far North Atlantic have become cooler and SLP anomalies throughout most of the Atlantic have increased. The decrease in far North Atlantic SSTs in the past three years has been associated with a weaker thermohaline circulation. Annual mean SSTs in the North Atlantic have cooled in 2013 and 2014 compared with values averaged from 1995 to 2012. A large variety of other climatic factors have also been shown to be linked to phase changes of the AMO including frequency and intensity of El Niño and likelihood of Sahelian drought. Consequently, the impacts of a potential phase change of the AMO extend well beyond its impacts on Atlantic basin hurricane activity. Abstract. Decadal variability is a notable feature of the Atlantic Ocean and the climate of the regions it influences. 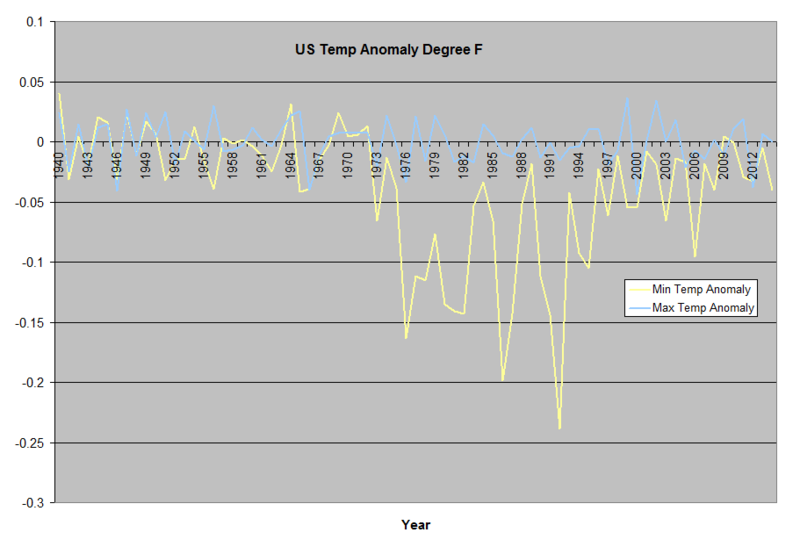 Prominently, this is manifested in the Atlantic Multidecadal Oscillation (AMO) in sea surface temperatures. Positive (negative) phases of the AMO coincide with warmer (colder) North Atlantic sea surface temperatures. 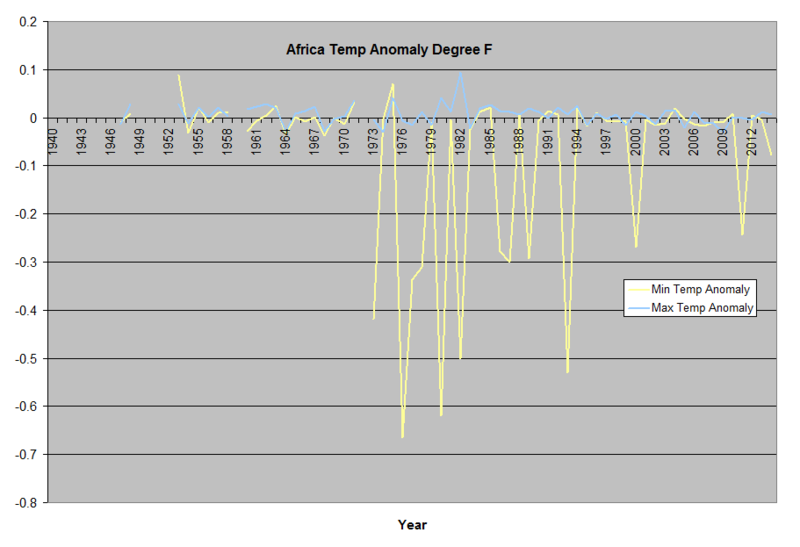 The AMO is linked with decadal climate fluctuations, such as Indian and Sahel rainfall1, European summer precipitation, Atlantic hurricanes3 and variations in global temperatures. It is widely believed that ocean circulation drives the phase changes of the AMO by controlling ocean heat content. However, there are no direct observations of ocean circulation of sufficient length to support this, leading to questions about whether the AMO is controlled from another source. Here we provide observational evidence of the widely hypothesized link between ocean circulation and the AMO. We take a new approach, using sea level along the east coast of the United States to estimate ocean circulation on decadal timescales. We show that ocean circulation responds to the first mode of Atlantic atmospheric forcing, the North Atlantic Oscillation, through circulation changes between the subtropical and subpolar gyres—the intergyre region. These circulation changes affect the decadal evolution of North Atlantic heat content and, consequently, the phases of the AMO. The Atlantic overturning circulation is declining and the AMO is moving to a negative phase. This may offer a brief respite from the persistent rise of global temperatures, but in the coupled system we describe, there are compensating effects. In this case, the negative AMO is associated with a continued acceleration of sea-level rise along the northeast coast of the United States. If the Atlantic Ocean is indeed slipping back into a colder-than-normal phase (i.e., negative AMO) then this would quite likely have a significant impact on Northern Hemisphere (NH) sea ice areal extent. 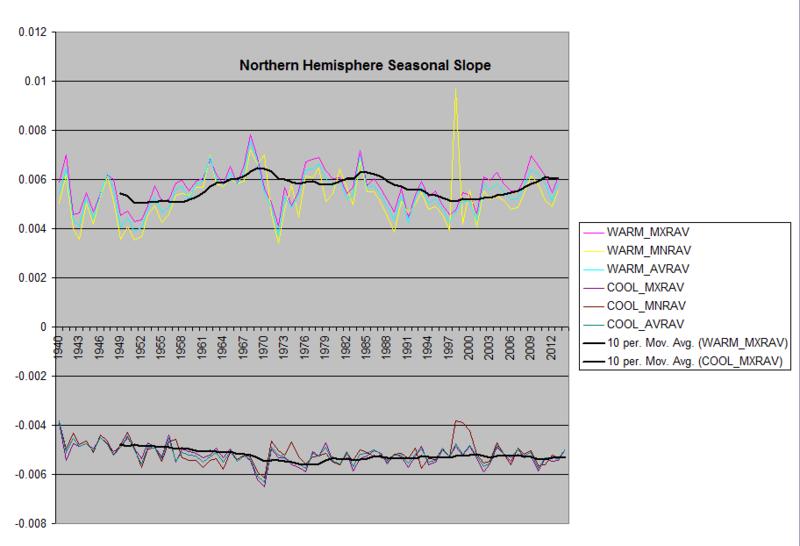 The NH sea ice areal extent was generally at above-normal levels before the middle 1990’s (arrow in plot below) which is when the Atlantic Ocean temperature phase change took place from cold-to-warm. Once the warm phase of the Atlantic Ocean became established in the late 1990’s, the NH sea ice areal extent trended sharply downward from positive levels into well below-normal territory. In recent years, there has been a jagged, but generally sideways trend in NH sea ice areal extent at those well below normal levels. 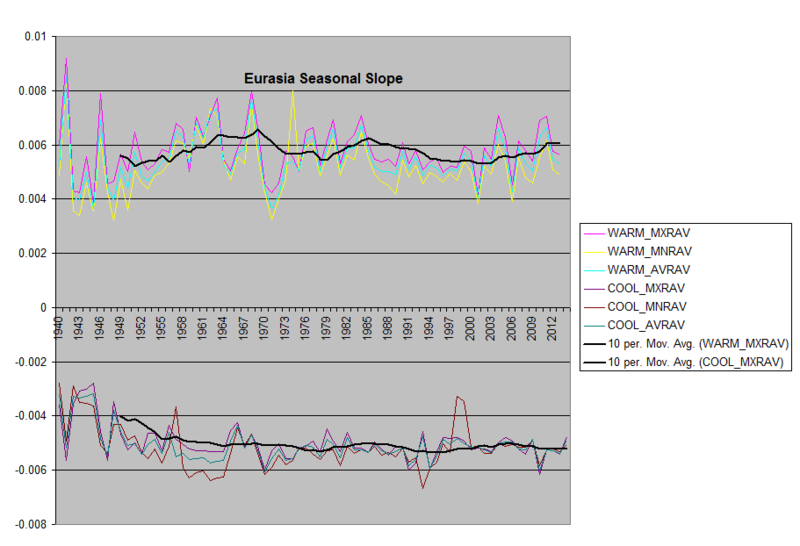 However, if these recent signs of a possible long-term Atlantic Ocean temperature phase change from warm-to-cold are “real and sustained” (and sometimes there are false starts), then the NH sea ice areal extent will very likely return to above-normal levels in the not too distant future – just as it was during the last cold phase pre-mid 1990’s. Hmmm . . . not looking too negative in recent years. 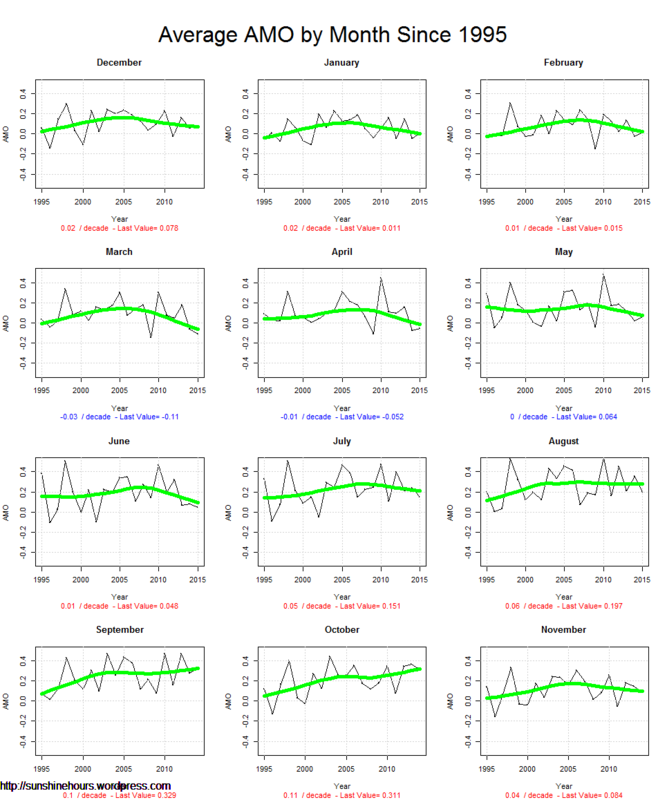 If you look at the ‘official’ NOAA AMO monthly index data page [link], you don’t see too much in the way of negative monthly AMO values (4 of the months in 2014 had slightly negative values). Reading the fine print, I see that they use the Kaplan SST v2 to make the calculations – I do not regard the Kaplan SST as one of the better SST data sets (I prefer the HADSST, or OISST). So, not only does the method of determining the AMO matter, but presumably also the underlying SST data set used in the calculation. So, does the Klotzbach/Gray version of the AMO combined with low Atlantic hurricane activity, along with a slow down in the AMOC, portend a flip to the cold phase of the AMO? Here is the way that I have been looking at this, which is encapsulated by the stadium wave wheel. 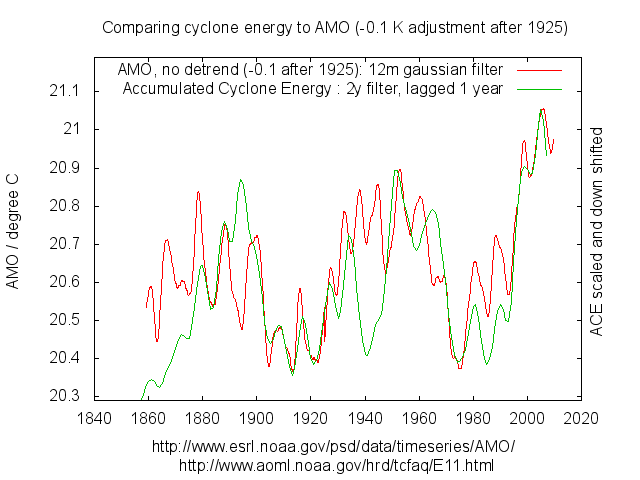 According to the stadium wave wheel, we passed peak AMO circa ~2010, so we are arguably in a declining phase, heading to a time in the ~mid 2020’s when the index switches to the cool phase (I’ve seen other estimates of the switch around 2030). The stadium wave says nothing about short term fluctuations, such as was seen in the mid 1940’s. Perhaps we are encountering an analogous cool blip, to return in a few years to warm values. Or perhaps we are headed for a surprise. If the AMO is truly an unforced internal oscillation, the oscillation can cease, change frequency or amplitude at any time. If external forcing (e.g. solar) plays an important role, then such a dramatic change is less likely. Since we are still trying to figure out the AMO, we really don’t know. With regards to sea ice, and I have been predicting this for several years, I see a recovery occurring in the Atlantic sector of the Arctic. With regards to hurricanes, I took a look at the number of Atlantic hurricanes during the period in the mid 1940’s with cool AMO [link], and I don’t see a dip. Klotzbach and Gray have their work cut out in terms of trying to figure out why we have had 3 dud Atlantic hurricane seasons in a row. The El Nino’s obviously played a role, but new complexities seem to be emerging. JC forecast: The AMO seems to be headed for the cool phase, I think we need to start watching for a cool flip around 2020 (I think it is early yet to see a flip). But I am prepared to be surprised. Fascinating article. I actually was able to follow most of this. Thank you for my regular dose of climate sanity. Based on the included figure, if it replicates the behavior from 1925 to 1960, there will be a dip followed by another positive peak lasting for a couple of decades. If it replicates that from 1885 to 1900 it’s over. Interesting that the negative phases appear to very roughly replicate the preceding positive phases. OTOH this could all be anecdotal: there are only two of each in the data, and they’re very different. If the AMO is truly an unforced internal oscillation, the oscillation can cease, change frequency or amplitude at any time. IMO this should be the default assumption. Any effort to tie this to external “forcings” would seem to me likely to be an exercise in curve-fitting. Yeah, it looks quite variable. There seems to be ocillation in the intensity of the phases, but the phases themselves to seem to be necessarily in synch all the time. Look at the first fifty years, there’s huge overlap of the negative a positive phases, it’s like there’s a negative phase peak when the positive phase has just started declining. Looks like a temporary phenomenon that could fall apart at any moment. A stadium wave, temporary syching of many different ocillations. The big, distinct postiive and negative phases post 1930 are probably a transient phenomenon that may be falling apart. Look at the positive and negative values seperately. The phases (postive and negative) themselves don’t seem to be necessarily in synch all the time. So as I understand you, you’re suggesting that the AMO (index) is actually driven by several semi-independent processes with (likely) different periods. If so, it would seem to me that each of those processes would have a greater chance of being influenced by increased pCO2 than the “global average temperature”. And that influence could well apply to the period(s) as well as the amplitude(s). But given the number of dimensions in which influential factors could be moving, I’d say that even without changes to the pCO2 the default assumption should be unforced, and unpredictable, variation. One big dip is not a flip. 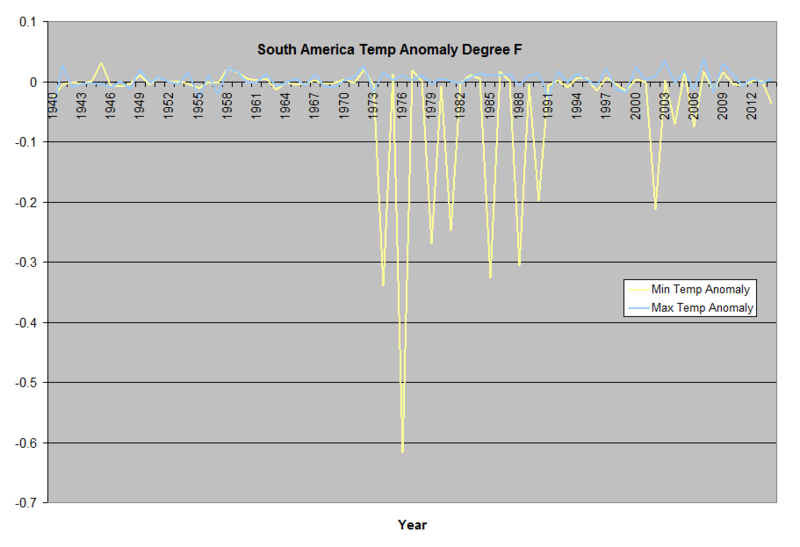 If ACE is dropping and SST is not I’d be looking at what “corrections” have been made to SST data. With regards to hurricanes, I took a look at the number of Atlantic hurricanes during the period in the mid 1940’s with cool AMO [link], and I don’t see a dip. Firstly I think it’s important to look at ACE not number of hurricanes ( as in your linked presentation ) if we are seeking to understand physical causes, it is energy that is conserved not numbers or percentage of storms in a certain category. There is large dip in ACE during the WWII period but this is probably largely due to disruption of data gathering and changes in shipping patterns during the war. Many storms at sea would have been missed. It should not be arbitrarily dismissed but must regarded as unreliable. It should also be noted that I’m plotting actual SST NOT detrended. Again, if we are looking for a causal link between TS energy and SST it makes no sense to detrend SST. Climatologists are obsessed with detrending data ( it has become the norm ) but this simply reflects their preconceived conviction that any long term rise in anything is due to AGW and everything else is trend free “internal oscillations”. 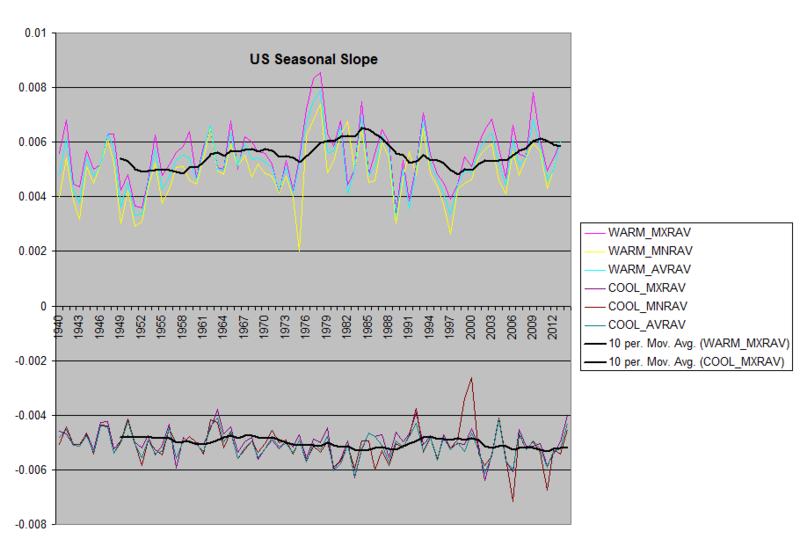 The degree of correlation in the decadal cycles in both datasets is striking. My neighbour, now 94, served on the arctic convoys heading to Murmansk and on other routes. He says nothing was further from their minds than taking SST’s and much other data. I think we really just ought to accept that the war years (and several years after) will forever be a closed book and stop trying to make up scenarios using non existent data. Ya I had a friend. Therefore throw away the data. My roommate in grad school specialized in mideaval monasteries. In particular the accounting documents. The monks were the worst liars. Therefore we should just give up using any old documents. Finally you begin to see, Steven. So, if the data is non existent, patchy in the extreme or made up to satisfy those back at the Ministry of defence, how worthwhile is it? Or do you take the view that any data, no matter how suspect it is or how poor it is or how non existent (in reality) it is, it should be used as a valuable part of the climate story? What amazes me is people just accept that the AMO is doing something. For the most part it does not do anything except what the GMST tells it to do. So lately the GMST has been telling it, despite what the AMOC has been indicating, to go up. Why? Because it’s hot this year. The AMO has got nothing to offset that. Nada. Zippo. It’s a powerless powerhouse pretender. The PDO is the beast. The Atlantic does have an influence on ENSO. Dr Curry, if the AMO continues to go cold, how will that fit into the stadium wave? The last positive phase of the AMO lasted about 30 years, with a 30-year negative phase afterwards. The current positive phase is only about 15 years old… so if history repeats itself, we’ve got another 15 years to go before it turns solidly negative. But the one before only lasted about 15 years. Or, if increased CO2 is actually causing the length of the phases to increase, this phase might last 60-75 years. Thanks, Professor Curry, for your role in inserting glimpses of reality into the daily dose of AGW propaganda! I think once it goes into the cool phase, it stays there, because of what Greenland’s increasing melt rate is doing to the North Atlantic. Predictions for when it will go ‘cool’ and how long it will stay there? If Greenland’s increasing melt rate is changing circulations (presuming this is what you’re considering) wouldn’t one expect the feedbacks associated with the ‘cool’ phase to then modify? 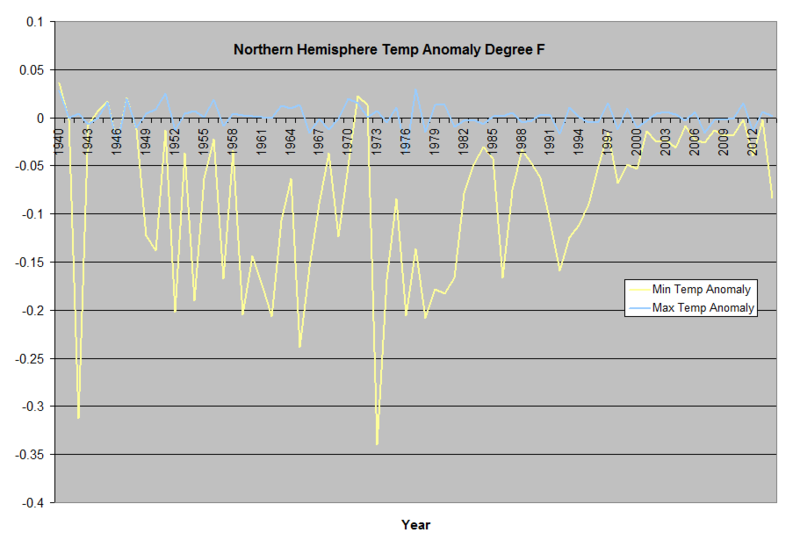 Climate seems to seek equilibrium’s and not extremes within it’s cycles. A meltwater pulse can last for centuries and get a lot colder in the North Atlantic and downstream with a rapid sea-level rise accompanying it. It is just a different mode, not even an AMO phase after a while. This is the gist of Hansen’s recent paper. 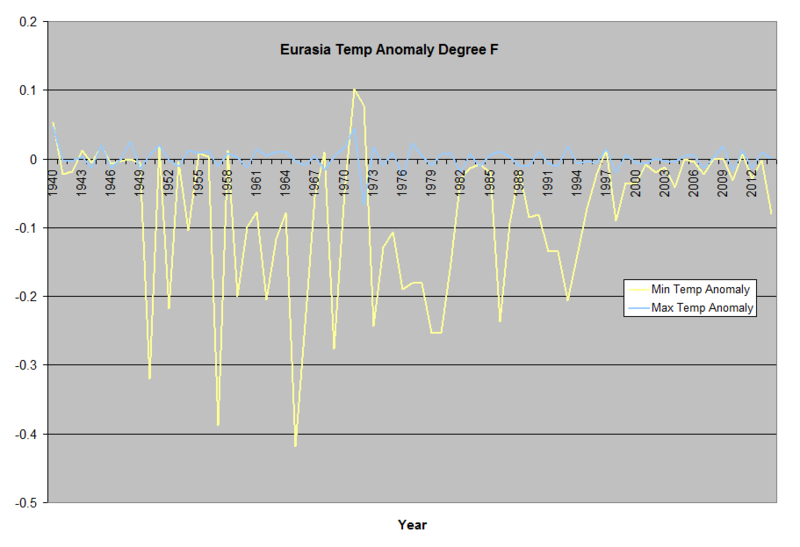 Climate seems to seek equilibrium’s and not extremes within it’s cycles. Thanks AK! Great Mosher impression. So help me out here (I’m really not about to argue via questions). Are you saying climate does seek extremes? Are you saying climate does not seek equilibrium’s? Are you saying climate does not ‘cycle’? (Think I addressed all the segments of my statement). Maybe these would affect the climate. Anything is possible but this, you may be sure. 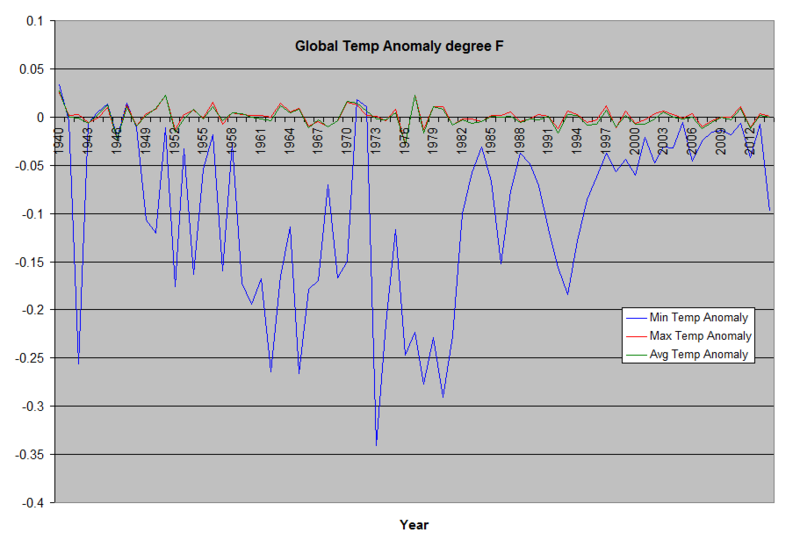 Are you saying climate does seek extremes? Climate is a hyper-complex non-linear system. Such systems are full of “feedback” loops, some with negative some with positive “feedback” at any time. As long as a loop produces a negative “feedback”, there will be a tendency to vary in a cyclical manner. Loops that produce positive “feedbacks” tend to “seek extremes”, within their local situations. But the movement of any “feedback”-driven parameter can cause the extent and the sign of any “feedback” loop (including its own) to change. Are you saying climate does not seek equilibrium’s? Yes. I’m saying it doesn’t. “Equilibrium” is a myth when it comes to “climate”. Are you saying climate does not ‘cycle’? Only by accident, in dimensions where some negative “feedback” loop drives the major metric(s). Or where driven by an overwhelming external cycle such as daily or seasonal solar changes. Thank you. Much to digest. My initial reaction is that we’re looking at this from two differing perspectives. When using the term climate I’m thinking about the entirety. 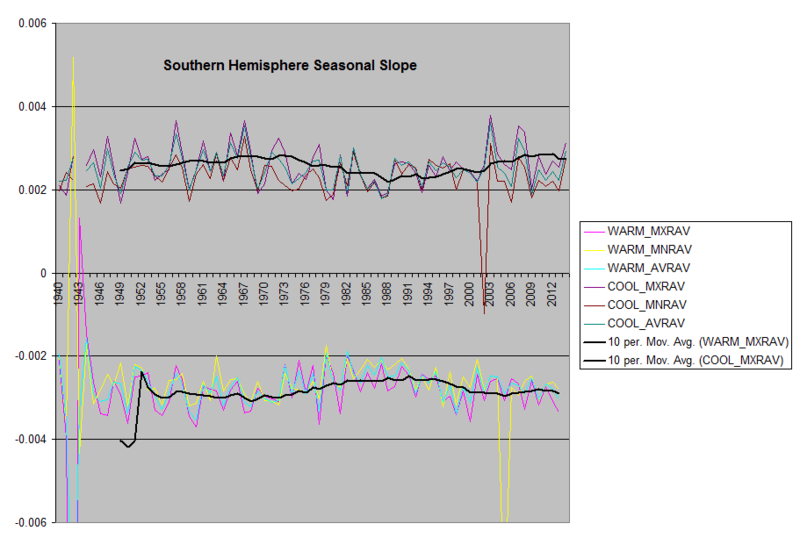 In referencing a hyper complex non-linear system it seems there was then a transition to a set of ‘sub-systems’ in your statement and your descriptions associated absolutely make sense but from an overview our climate (the entirety) does not seem to tend towards extremes but instead tends towards a mean (equilibrium). (Hope this make sense). As long as there is a DELAYED negative feedback. When using the term climate I’m thinking about the entirety. In referencing a hyper complex non-linear system it seems there was then a transition to a set of ‘sub-systems’ […] but from an overview our climate (the entirety) does not seem to tend towards extremes but instead tends towards a mean (equilibrium). Which makes it a myth: a metaphor intended to incent some action. We might say climate seeks one equilibrium among many. That equilibrium value may change suddenly as a new climate regime is entered. Using the word stability, we see stability in our weather. Then we see instability followed by stability. Describing an ice age as stable, as far as slowly adding to ice sheets we could say, yes the equilibrium is cold. It’s supposed to be cold. Yet for the past ½ million years, ice ages end and I think it’s because of instability caused by the long prior period of stability. An example of stability destroying itself as instability also does. Ice ages were hardly “stable”. On a time scale of tens of millennia, they varied widely, although the average temperature (and, apparently, pCO2) tended to stay low. But there were enormous variations where, and how deep, the ice was. Nonlinear emergent pattern and oscillation are a little more counter-intuitive than that. Negative feedback – referred to as friction or damping, will as a short range effect slow down system changes, but the longer range effect will be to actually promote emergent structure and complex pattern. Nonlinear pattern formation is thus a signature of a frictionally damped dissipative system. Positive feedback and on the other hand drives oscillation, not runaway unidirectional change since positive feedbacks are self-limiting within the system as a whole. However as the classic work on platinum-catalysed CO oxidation showed, positive feedback above a certain level will cause chaotic structures to collapse onto a simple monotonic oscillation. Thus in such a complex dynamic nonlinear system, complex-chaotic behaviour is a sign of negative feebdack while oscillation – especially monotonic – signifies positive feedback. The climate atmosphere-ocean system does indeed contain a complex mox of both positive and negative feedbacks. For instance the ENSO is animated by the Bjerknes feedback between Perivian upwelling and trade winds. This limited positive feedback drives the intermittent rapid oscillatory swings characterising el Nino and La Nina events. But the Bjerkes mechanism is damped by negative feedbacks resulting in the complexity and intermittency of ENSO. In short, the gulf stream transports higher saline water to the North Atlantic where, after cooling, its higher salinity drives powerful downwelling and cold deep water formation. This formation and southward flow on turn drive the gulf stream further, and so on. But this positive feedback, like all such positive feedbacks in the climate system, is time limited not runaway and continuous so, rather than turning the Atlantic into a frothing spinning Jaccuzi, instead it resilts in periodic major switches and shifts in the AMOC and gulf stream. Friction and damping are not feedbacks of any sort. They are losses. When you apply the brakes in a car it does not have a tendency to make the car go back to where it came from ! … in common with many CE readers. That is fully contradictory, the RAPID data clearly shows low AMOC events occurring during negative NAO episodes, and the negative NAO episodes are directly associated with the warming pulses to the AMO. 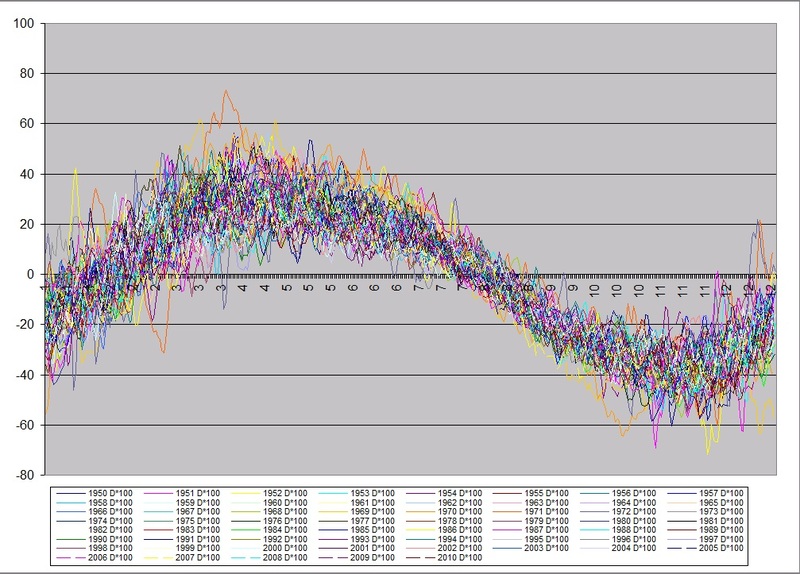 I had solar based forecasts for more positive NAO conditions for 2013-2014 several years back, which is why the AMO had seen a slight cooling recently. 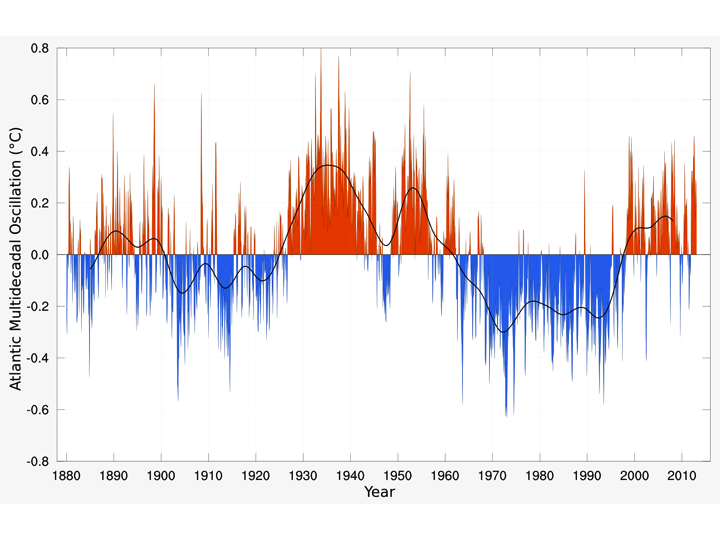 We know that the AMO was warm during the last solar minimum in the late 1800’s, and extremes of low Arctic sea ice extent were recorded 1816-1818 during the Dalton Minimum. Which is what we will see again through the next ten years, with a large increase in solar caused deep negative NAO episodes. I can readily produce solar based forecasts at weekly scales through the whole period for when the main negative NAO hits will occur. The AMO has an envelope of around 69yrs, it will cool from the mid 2030’s, and reach its next coldest point in the mid 2040’s, as that is when solar wind conditions will be much stronger again as in the mid 1970’s. The AMO tends to move in phase with solar cycles in its cold mode, and out of phase with solar cycles in its warm mode. The brief cooling of the AMO around this sunspot maximum follows that pattern. Wouldn’t you think that non-polar coronal holes are a greater cause of solar wind variability at Earth? there is a strong 28.9 day signature; high latitude event. Ulric I think you meant to say large decrease. never mind I read it wrong. The significant units of action in atmospheric circulation are waves of varying amplitudes which manifest as air masses in the lower atmosphere. The periodicity of waves varies from a few days to perhaps a month. It is difficult to conceive of decadal oscillations when fluctuations of sign,amplitude,orientation etc. appear. 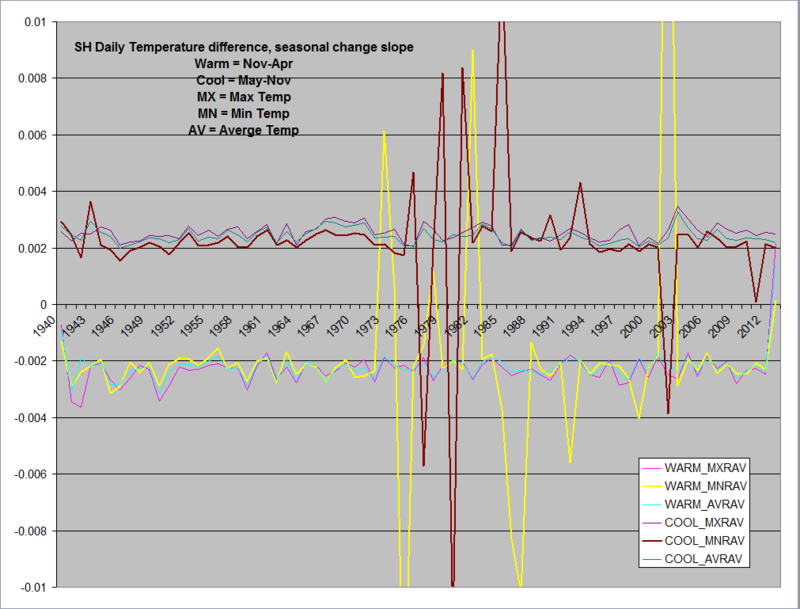 Also, seasonal variation would appear to be an order of magnitude greater than the variations of the oscillations. I don’t doubt the statistics of observations that such fluctuations exists. The pattern of the PDO is quite striking. And I can imagine that a particular wave pattern would cause ocean heat to accumulate in one region and to dissipate in an adjacent region which could feedback to that particular wave pattern. Still, it is frustrating to discuss these phenomenon in the absence of a unifying theory of causation. We consider the evolution of logistic maps under long-term memory. The memory effects are characterized by one parameter α. If it equals to zero, any memory is absent. This leads to the ordinary discrete dynamical systems. For α = 1 the memory becomes full, and each subsequent state of the corresponding discrete system accumulates all past states with the same weight just as the ordinary integral of first order does in the continuous space. The case with 0 < α < 1 has the long-term memory effects. The characteristic features are also observed for the fractional integral depending on time, and the parameter α is equivalent to the order index of fractional integral. We study the evolution of the bifurcation diagram among α = 0 and α = 0.15 . The main result of this work is that the long-term memory effects make difficulties for developing the chaos motion in such logistic maps. The parameter α resembles a governing parameter for the bifurcation diagram. For α > 0.15 the memory effects win over chaos. They need to do another paper that deals with negative a, which I think might becoming more common in the internet age. Along those lines, ENSO descriptions used to center on the Pacific temperature anomaly as the source of variation – Equatorial Pacific SSTs changed the circulation. But is causation reversed? Is there a spectrum of global circulation patterns, roughly a quarter of which manifest as higher EPac SSTs? and roughly a quarter of which manifest as lower EPac SSTs? and roughly a half, not much change in EPac SSTs? The ‘Westerly Wind Burst’ is seen as a pre-cursor to ENSOs, so that sounds as if circulation change is what drives the SST change. Are PDO, AMO, AO, etc. 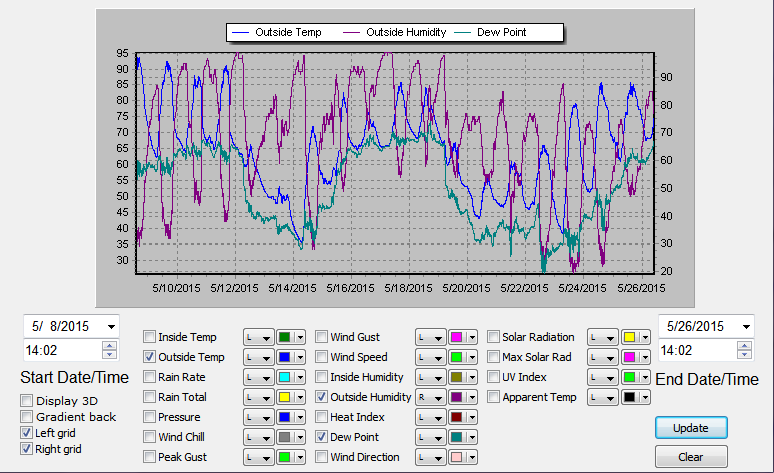 variable wave fluctuations that manifest in a similar surface temperature or pressure signature? Over the last 20 years or so the AMO and PDO have been in counter-synch so I’m not giving much weight to an external-forcing hypothesis, though up to about 1965 the turning points on the two charts corresponded quite well. As a layman I was under the impression that tropical cyclones were driven by the temperature differential across latitudes, and thus the prediction of a cooler northern Atlantic resulting in fewer hurricanes puzzles me a bit. Less difference between northern atlantic and actic? Not exactly sure what you mean by “driven” but large Atlantic cyclones typically originate when atmospheric troughs, or waves, move from the African continent over the ocean. The energy released by warm tropical ocean “feeds” the pattern while cooler waters provide less energy (and the storm dies). An excellent overview, I have saved it for a future reference. Tank you. 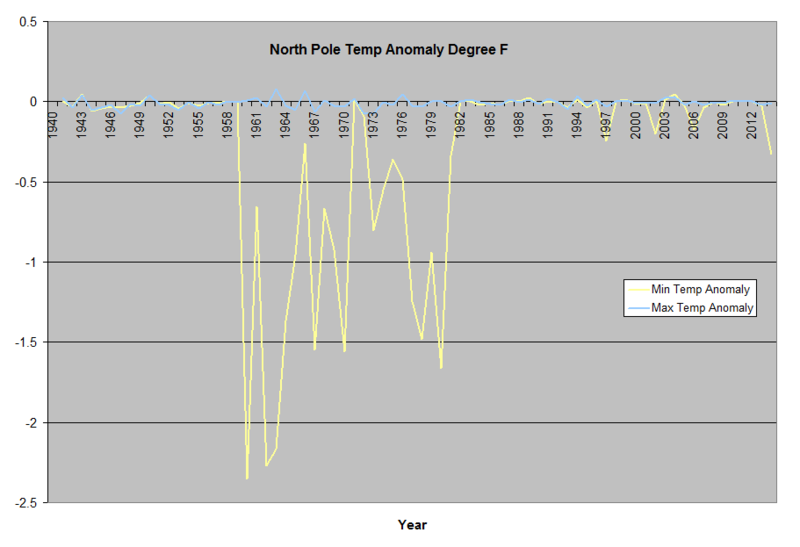 The AMO has periodicity of around ~ 60 years (most likely around 64). As this is an oscillating variable calculating the trend line should be limited to full number of cycles calculating back from 2014 (looking at the annual data). For two full cycles the N. Atlantic SST data prior to 1900, should show a clear peak, but it doesn’t. 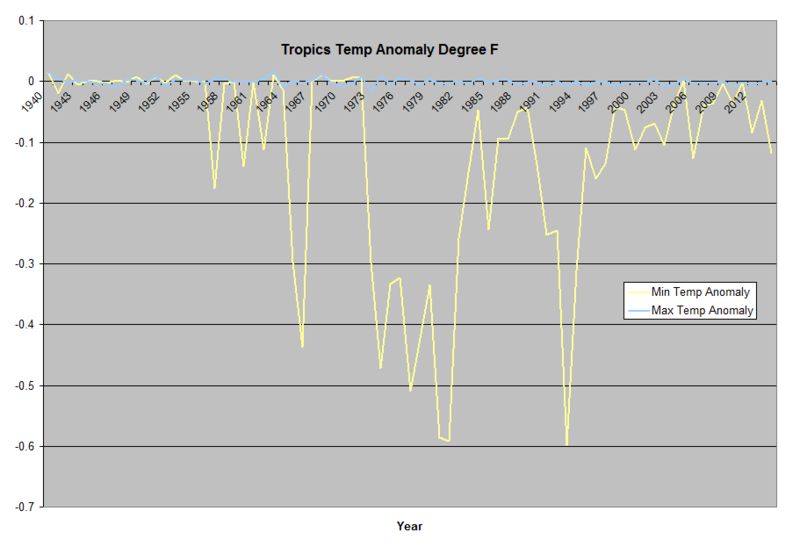 For almost 50 years of the early data the SST shows no trend, hence for calculating the trend it may be advisable to use just one cycle (in this case 1940 to 2014). As it happens this may not make great deal of difference. From the above it may be concluded that the ‘negative’ AMO may be some years off, considering that the 9 year cycle is near its minimum, and may soon be on the upward trend. The N. A. SST on the multidecadal scale rises slowly and falls fast, but considering that the last peak lasted some 20 years, I would agree that the AMO’s ‘flip’ around 2020 is the most likely outcome. Seems to me that our knowledge of this powerful weather and climate mechanism is evolving rather than settled. We have just seen our best 6-day period of the summer, ending tonight. This coincided with a 6-day work holiday in which I was able to sort the garden for the winter. Thank you, Mother Nature. A harsher winter is still possible, since there have been mostly easterly, or northerly, winds. Both are freezing directions in winter. The Stadium Wave Theory could easily stand a few colder years, unless the cold builds beyond that. Of course, the theory could be amended in the light of experience; surely a lesson for the ‘settled science’ crew. haven’t seen it mentioned lately, is it out of fashion now? If AMO turns cold, is the ‘missing heat’ doing an even better job of hiding than was thought? What Trenberth said is the missing heat had either gone into the oceans or into outer space. He said it was travesty the earth’s monitoring system could not answer the question of what became of the missing heat. It is impossible to look for the missing heat in outer space. So the only way to answer the question was to look for it in the oceans. Perfectly logical. If found in the oceans, it’s found. If not found in the oceans, it went into outer space. It’s also a travesty that after hundreds of years the earth’s monitoring systems can’t answer the question of what’s become of all the missing phlogiston. No, that is not a travesty. Trenberth was right. Of course, we need to know how much energy is ‘missing’ before we can be sure we have found it. Thomas Stocker said we do not have the technology to monitor the deep oceans (below 2000m) so we don’t know if it is there or not. If it is, that is likely to mean it is of little consequence due to the depth and coldness. As for it going into space, that DOES seem the most likely avenue and we need to be able to monitor it better so we can know for sure. I thought the ‘missing heat’ was found in the Arctic oceans. Perhaps easily dissipating into space. If it is there, then it would be of significant consequence as what put it there can stop putting it there and start putting it at the surface. The point of this post is to show the uncertainty about solar or for that matter any other force and the phase of the AMO. A number of studies have suggested a generally weaker AMOC during the LIA compared with today41, 42, 43, resulting in a generally weaker northward heat transport and decreasing North Atlantic SSTs at high northern latitudes43, 44, 45. The cause of this weakening of the AMOC during the LIA has been much debated, but it appears to be linked to a predominantly negative NAO40, 41, 46, 47, 48, 49 phase causing a weakening of the Northern Hemisphere westerlies. This may have been combined with an El Niño-like state in the Pacific region causing a northward shift in the Southern Hemisphere westerlies, thereby decreasing the exchange of water between the Indian Ocean and the South Atlantic50, 51, 52. The cooling of the Northern Hemisphere also resulted in a southward migration of the Intertropical Convergence Zone53, 54. Before the transition around the termination of the LIA, the two AMO reconstructions indicate almost opposite relations to external forcing. 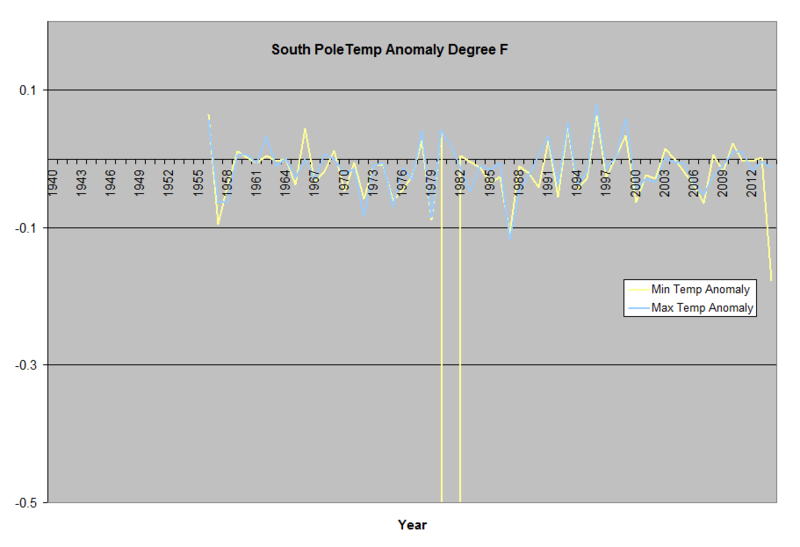 The most notable discrepancy between the two AMO reconstructions coincides in time with the Maunder Minimum, a period during which the tree-ring AMO4 indicates a positive AMO phase, which results in the marginally significant negative relationship with solar forcing (Fig. 3a). Contrary to this, the multiproxy AMO24 shows no relationship with solar forcing during the LIA, but a potentially close relationship with volcanic forcing (Fig. 3c). The regression analysis indicates similar relationships between volcanic forcing and the multiproxy AMO before and after the transition around AD 1775. Remarkably, this appears to be the most consistent relationship between one of the external forcing components and the AMO reconstructions throughout the last 450 years, which underlines the potential importance of volcanic forcing as a driver of North Atlantic SST variability. Another perspective . The upshot is we wait and see. My prediction is for the AMO to flip negative by 2020 ,regardless of prolonged minimum solar activity or maybe due to it. Time will tell. The AMO remained positive throughout the Gleissberg Solar Minimum of the late 1800’s. Looks like GCMs will need to incorporate a few more parameters. yet another take by ulric. Time will tell. Be careful that you do not take credit for what I have shown in the data. I do not know the answer. I want to see if you are correct. This is your thought. The problem was where you wrote “..which is what I have been saying for over two years here and elsewhere”, which sounds like you are expressing your own position, as those are not my words. And then you followed that with what I had said, but you provided no link for this “July 16, 2015 at 10:52 am” comment, where did it come from please? John Von Neuman, a famous mathematician. Father of the computer architecture and game theory. Said about 1951, IIRC. Britain has had a cooler than normal summer his year. I can personally verify that the Atlantic ocean around the coasts of Cornwall and Devon is perishing cold his year. I didn’t dare try any more than a padde in case I caught hypothermia. This article from dame Julia slingo of the met office written at the end of August confirms that the Atlantic is two degrees colder than normal this year. Tony, perhaps the MO should stop long term forecasting and concentrate on one or two days ahead. I have noticed they are often quite accurate in telling us what happened yesterday but.three to five days ahead? I think not. Most weather models do fairly well 3-10 days ahead. Problems creep in around 6 months but how can anyone credibly predicts years, tens of years, hundreds of years and to infinity and beyond. Amazing arrogance mostly fueled by the media forgetfulness and impossibility of holding accountable for future results of predictions. One only has to look at children won’t know snow in Great Britain and ice free arctic stories. Thank you for making my point. Will individuals get used to their state then? Regretfully no eco-green-seaview-sporadically inland bound electricity for Tony B. Thanks for that link. It is very good news as this was gong to be a horrendous blot on the seascape and would cause untold problems for sailors. However, it does highlight the blind avenues we have gone down with those wanting to farm the huge renewables subsidies available which have left us with a dwindling number of grown up power stations. Unless someone does something urgently we will have rolling blackouts within three years as soon as we have a burst of extreme cold weather or the economy expands a few more percent? Have you ever been to the February Nice carnival as I had been thinking of going. Yes, twice so did the rest of the family, it lasts nearly three weeks. Wednesday’s and Saturday’s flowers parades are usually the most popular, the Wednesdays’ tend to be less crowded. Book the flights early (usually about £60-£70 return EJ or a bit more BA) both from Gatwick (2-3 flights a day each), Heathrow about £20-30 extra. If you do go I’ll organise an official tour of my ‘front garden’. Britain has had a cooler than normal summer this year. I may not say this often but we should all familiarize ourselves with what scripture has to say on this very subject. We mere mortals estimate the Sun will fry the Earth in around 4-5 billion years, one way or another. Is the estimate of the immortal author of the scriptures more or less than this? Multi-cellular life arose on Earth 600 million years ago and will be gone in another 600 million years because the Sun is heating up. Leif’s value is consistent with mine. The difference between 0.6 billion years and 4 billion is the difference between Earth becoming uninhabitably hot (at that time Mars will be in the Habitable Zone) and Earth being fried—or melted—along with Mars etc. Ocean heat transport dropping since 2004. Ocean heat content dropping since 2007. SSTs dropping since 2011. Looks like something is changing in the N Atlantic. Maybe we are reversing a 250 year trend. Brrr. I’m wondering where’s the rain in SoCal? 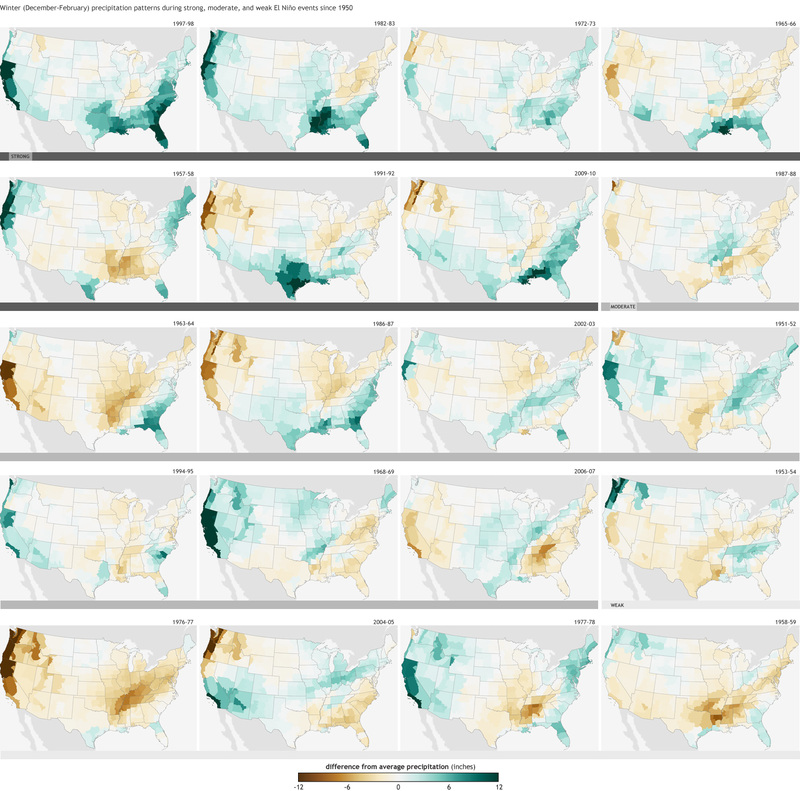 I’ve heard anecdotally that the rain from El Nino comes toward the end. Will we get torrential rain this winter? Last January both oceans seemed fairly passive. In June both the Blob and El Nino seemed in full force. El Nino still looks strong but the blob appears to be weakening. This guy says this is a super El Nino. He says this one is now bigger than the 1997-98 monster. Is this true? Is it relevant? Very insightful, thanks for the info. It would be relevant if true, but so far not true. It appears to me to be fairly flat? So did the 10 years around 1940/45. Thanks for the charts. It helps people like me who don’t know much. I appreciate your web site as well. I have learned a lot from it. If the arctic is the climate canary and one that reacts more quickly ( in terms of signal emerging from noise). And if the Atlantic drives some of the change in the Arctic. Does this means we might have a chance to see a lack of CO2 signal/muted CO2 signal/strong CO2 signal within a decade or so that might change the dynamic of the concensus? Magnetic fields from the solar core protrude through the photosphere as sunspots and help transport heat out to the planets. 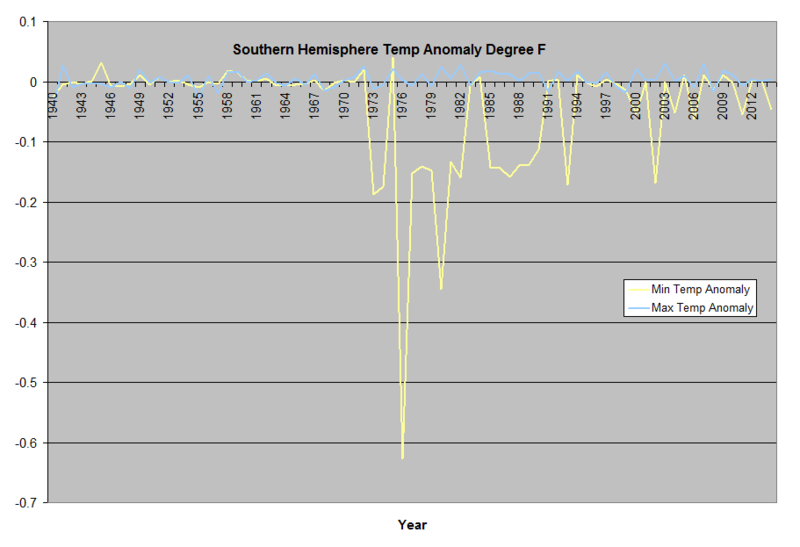 The Sun gets hotter and Earth cools when there are less sunspots. Earth’s magnetosphere responds to geomagnetic storms differently during odd and even magnetic cycles. Strong teluric currents are induced in the oceans and electrically conductive iron rich lithosphere, but too weak to contribute to the surface temperature changes. 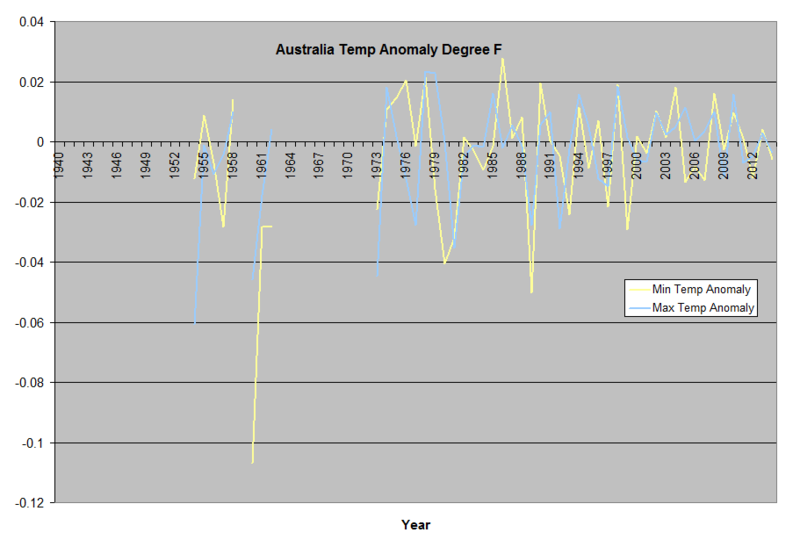 This is very noticeable in parts of Australia where temperature closely follows sunspot magnetic cycle. 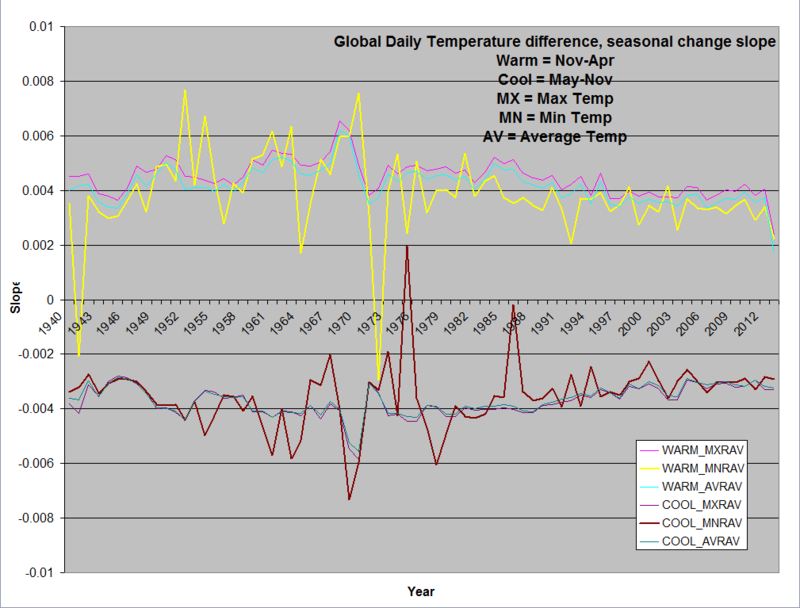 warm periods are coincident with the odd numbered cycles. In the higher frequency range, the strongest spectral component in the Crutem4 is coincident with the solar magnetic periodicity (just under 22 years), while in the case of Australia’s iron rich location the 22 year periodicity is greatly enhanced. Acting mechanism if any, is unknown. “[D]ense pulsar corr” or no “dense pulsar corr”, magnetic fields protruding from the solar core are perfectly capable of influencing both solar constant, and levels of very short-wavelengh radiation (from hard UV through gamma rays), as well as particles and magnetic field changes that can change how and where particles make it through to the Earth’s atmosphere. And if the Solar inner spheres are actually similar to current “consensus” in heliophysics, it’s quite possible that planetary positions could influence those magnetic fields through tidal effects. Which is why I’m highly skeptical of “scientific” denial about relationships between planetary positions and terrestrial weather. We have no evidence that a causal relationship exists, but there’s no evidence that it doesn’t, only laziness and stick-in-the-mud refusal to think outside the box. And, for the record, it’s a very old box. I can remember reading about such supposed correlations in the ’60’s. My approach when I began investigating this from 2004, was to not be initially concerned with mechanisms, so my search was not limited by such criteria. This led to identifying a predictable logic to planetary positions and their ordering of solar activity levels, with the extremes, as Kepler noted, in “magnetic angles”, which either augment, or diminish solar activity levels. What I am looking at, and forecasting with, rules out tidal effects. It’s a tornado on the Sun! Meteorologist Danielle Banks takes a look at this extraordinary NASA video of a plume of superheated plasma churning on the sun. Or perhaps we are headed for a surprise. If the AMO is truly an unforced internal oscillation, the oscillation can cease, change frequency or amplitude at any time. Or pause (not quite the same as cease). I vote for pause. Where is WebHubTelescope when you need him to back you up? He seems to have disappeared off this blog. Earth’s magnetosphere responds to geomagnetic storms differently during odd and even magnetic cycles. This is incorrect. There is a very weak response of the magnetosphere related to the global magnetic field of the Sun, but the that field changes polarity at solar maximum and so is not in phase with the even/odd designation of the sunspot cycle that changes at solar minimum. Regional annual averaged daily differences. 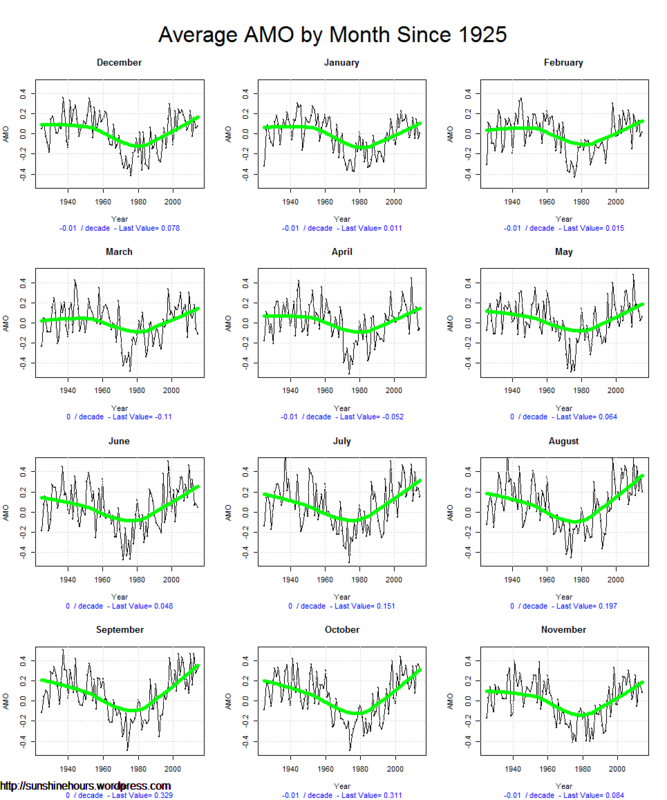 If you plot daily MnDiff daily for a year, it’s a sine wave. is flat, other than some large disturbances in the 70’s and 80’s, and then again 2003. 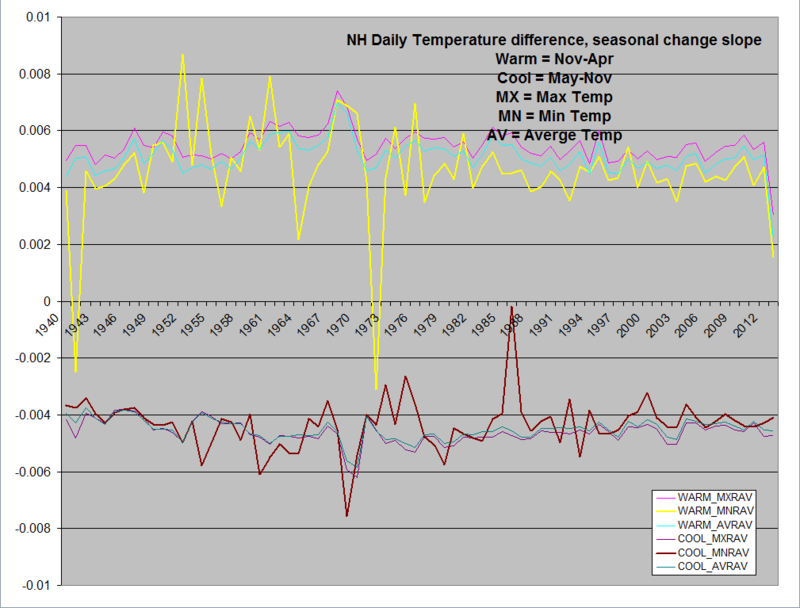 Ocean cycles and the warm cycle and the start of the cooling cycle. The US has the best surface station coverage in the world. I think these show the effects of the oceans moving heat around, and the winds carrying all of the energy captured in tropical evaporated water vapor on to the various land masses . You can see this effect at my location (N41,W81) Depending on the path of the jet stream we either get tropical air from the gulf, or polar air from Canada. and these changes show up in the temperature record.